GRAMMY® Award winner and top-selling artist Tasha Cobbs Leonard, releases new all-live album Heart. Passion. Pursuit. : Live At Passion City Church. Available today on all platforms, this one-of-a-kind project is the worthy follow-up to the highest-selling new gospel album of the past two years, and is the essential collection for Tasha Cobbs Leonard fans. Heart. Passion. Pursuit. 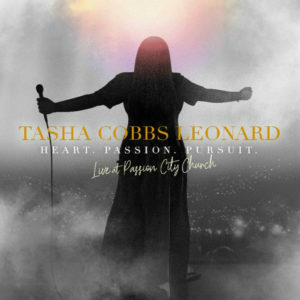 : Live At Passion City serves as the perfect companion piece to Tasha’s upcoming Revival Tour. Opening yesterday, the 11-show Revival Tour will showcase many of the songs recorded on the new album. The Revival Tour will play eight more cities amid growing excitement, as Tasha continues to sell out shows in Charlotte, New York and Baltimore. Tour dates and tickets are available at TashaCobbs.org. This entry was posted in Gospel, Reviews and tagged Heart. Passion. Pursuit. : Live At Passion City Church., Tasha Cobbs Leonard by Kris Patrick. Bookmark the permalink.